K.O was another dog who arrived in our arms quite by chance. My Aunty rang my mother from Cornwall one Saturday morning and said that she had just been to the vets and they were appealing for someone to take a 6month old collie brought into them that morning which was going to be put to sleep by a man who had lost his flat in a fire and was unwilling to take her on to his next accommodation. Mum wrote a pros and cons list, the Pros outweighed the cons and a very confused K.O (then Lady) was delivered to our doorstep. 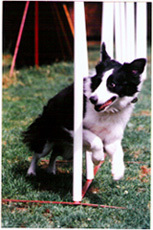 K.O, like Scrappy, started by doing obedience with Mum and it was something she naturally took to and did well in, but once again, when introduced to agility it became her firm favourite and the obedience competitions stopped and the agility competitions started. When Mum got her new dog, Phiz, K.O was passed to me. I was so excited; I had only competed in Junior classes with Scrappy but now at 10 years old I had my own dog and could compete in adult classes at last. But in order to do well in adult classes K.O and I had to up our game. A couple of years doing intense obedience had left K.O with an inclination to hang around my feet and look at me instead of where she was going (Velcro Collie!) and to start with I was tripping over her left, right and centre. So we took a couple of months out of competition to concentrate on building our relationship and trust and to re-train her to get her contacts and go on. Within a year of coming back to competition we won the Dogs in Need Under 12’s Final (Scrappy came 2nd handled by my brother) and then aged just 11, I won my first adult class, taking K.O and myself out of Starters and into Intermediate. I remember a number of jokes being made at the presentation because I had to have an adult come up and collect the champagne which came with the trophy because I was too young! Things weren’t all plain sailing with K.O, in our most successful year she was diagnosed with hyperthermia, (not be confused by hypothermia) an inability to control her body’s thermostat, during the vet’s tests her body temperature on exercise soared to 107.2 degrees! If she got too hot, it would be fatal. But the decision was made to continue doing the sport she loved so much, providing we carried things around to cool her down immediately after. Having been given only 6 months to live, she carried on for another 7 years and went training only days before we had to have her put to sleep. We had been almost certain that K.O would pass on a long walk, at training, or even in competition but she held on until the decision had to be made for her. K.O was a precious and amazing dog and will always be proof that where there’s a will, there’s a way. Guinness Book of World Records 60 poled weave (handled by Mum) – All 60 poles completed on both attempts, her best time was just over 16 seconds.